Hello and welcome to eighteenth episode of Fanboy Nation’s Toon-In-Talk, your rendezvous for animation interviews. Every year Whitney attends several of the biggest conventions in the US and one of her favorites is Dragon-Con held in Atlanta, GA. Dragon-Con is a big convention with an intimate feeling, because it allows you to have up and close interactions with the guests and it never feels too over crowded. The Dragon-Con staff are super organized and they are dedicated to ensuring fans have the best experience. Whitney also loves Dragon-Con for its diverse programming, especially the puppetry and anime/manga tracks. 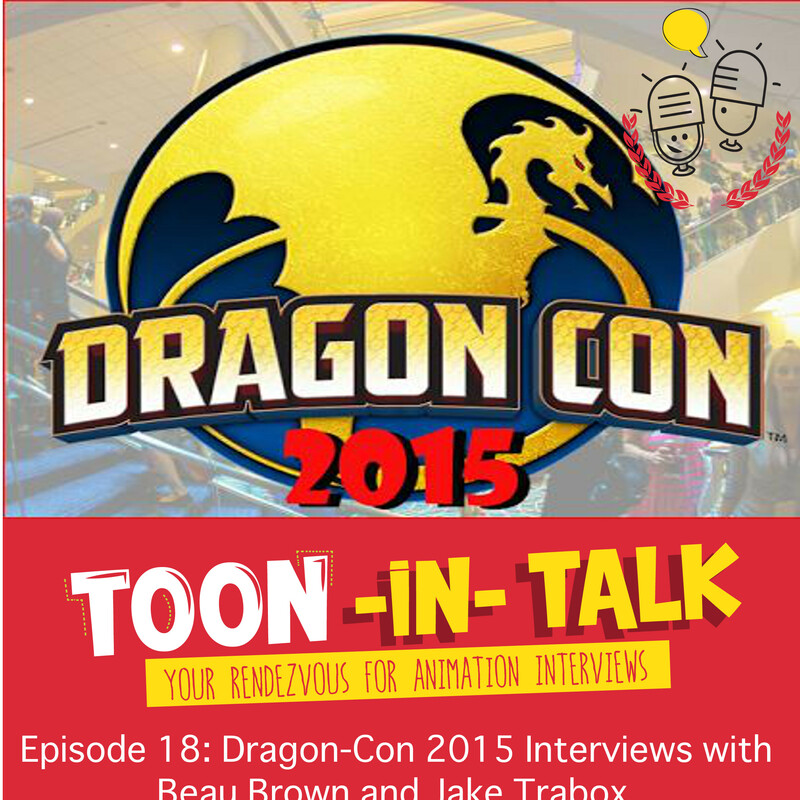 She was privileged to chat with puppetry track coordinator Beau Brown and anime/manga track coordinator Jake Trabox about the special events for Dragon-Con 2015. Jake Trabox heads the anime and manga track at Dragon-Con. He missed the entire anime and manga boom in the US, because he was in Japan. Dragon-Con is a huge convention, but it hasn’t gotten outrageously huge as San Diego Comic-Con. There won’t be any Japanese guests this year, it is difficult to get guests from the land of the rising sun to visit the east coast. There will be two rooms playing anime 24/7. Dragon-Con isn’t unique amongst anime/manga conventions, but you’re going to have a great time, meet great people, and be in the center of the action. Anime and manga fans have encouraged other fans to cosplay and wear more elaborate and intricate costumes. Darius Washington will hold a panel about how anime has shaped the animated heroine. Jake and his staff are going to be working very hard during the convention. Jake keeps going by drawing on his inner chi. Jake explains to Whitney how the convention scene works in Japan and it is practically nonexistent. There is one huge convention, Comiket, and then companies host smaller events featuring celebrities. He also tells her how the European and Dubai convention scene is growing. Beau Brown heads the puppetry track at the 2015 Dragon-Con. There are thirty-eight hours of puppetry-related panels this year. There are going to be many special guests from Sesame Street, including Carroll Spinney, Tyler Bunch, Leslie Carrera-Rudolph, and Pam Arciero. The Sesame Street performers will be featured guests at panels as well as holding workshops on puppetry. DJ Guyer and Steve True have their own LA puppetry studio and they make a lot of commercial puppetry. They’ll be handling workshops on construction and design. Jim Henson’s daughter Cheryl Henson will be a guest along with Henson archivist Karen Falk. They will be discussing Jim Henson’s unfinished holiday special Turkey Hollow. Steve Whitmire who performs Kermit the Frog and Debbie McClellan vice-president of the Muppets at Disney will be appearing to speak about the new Muppets show. Beau explains how Dragon-Con has worked with Henson guests in the past, including Fraggle Rock related guests from 2013. Dragon-Con has the special focus of helping amateur puppets improve their skills and interacting with professional puppeteers. Dragon-Con’s puppetry track has the biggest selection of puppetry material for at a comic convention. Puppet professionals Matt Laird, Mike Horner. Madison Cripps will be featured in panels. There will also be a panel discussing the Center for Puppetry Arts expansion. In the art show, there will be a special pop art exhibit featuring items from the Center for Puppetry Arts. If you are a puppeteer and want to learn more about perfecting your craft, there will be workshops for adults only to learn more about improving technique. If you want to attend an entertaining and mature show, check out the Dragon-Con Puppetry Slam, one of the most attended events at the convention.